Having some meal planning ideas when cooking for a crowd is very important. Picking what type of large crowd event you are having is always the first step. In my family, when I was growing up, cooking meals for a crowd was a common occurrence. It was always hard to find a seat to eat dinner with such a large family. I remember many times that Dad would place a board between two chairs so more people could sit at the table. Back then, we didn’t expect much. The only requirement was to have good tasting food, and plenty of it. If we could not find a place to sit, we would sit out on the back porch. Today, we expect more, both from ourselves and from others. If you have learned how to make some meal planning ideas in advance you can have just as much fun cooking for a crowd when entertaining. Even with no experience, anyone can do it, if you follow a written plan. FIRST QUESTION: Who will you invite? Remember, with paper and pen, start writing down names. Don’t leave anyone out, who is connected with the others. Gossip moves quickly. This will start problems, before anyone arrives. SECOND QUESTION: A very important part of all meal planning ideas is what type of food needs to prepared. Who are these people? Are they your family, who will overlook your mistakes? Are they your in laws or work colleagues who are more likely to find your flaws? This makes a difference when trying new recipes. I would suggest trying new recipes prior to the big event, especially if the guests are other than family. THIRD QUESTION: An important question to answer when cooking for a crowd is if there are any special dietary needs. Are there any diabetics on your guest list? This is not a great problem until it comes to dessert time. It would be extremely inconsiderate to serve a dessert that all your guests cannot eat. Provide an alternative dessert, and by all means make it clear which dessert is for your guests on a special diet. Consider also, that some guests may be on a salt free diets, low fat, or even vegetarian diets. These are all things that a good host or hostess will find out at the beginning of the plan. When you decide that you will be cooking for a crowd, an important factor of all meal planning ideas is to decide what type of meal you want to provide. First decide the time of day. Maybe you will be entertaining in the morning; maybe with a casserole. Perhaps if for lunch you might choose sandwiches and salads. Or will you be serving a dinner? This should be a pretty simple question for you to answer, considering the work schedule of most of your guests. You must include in your meal planning ideas a more important question is; “What types of meals will you serve?” Do you want to have a sit down dinner? If this is the case, you must be able to comfortably seat the number of guests that you listed on the “plan”. I have done this before in my home. My dining room table was not large enough, but my dining room connected to my living room by a huge opening. I simply added more tables from the end of my dining room table, and extended them into my living room. After covering with many white tablecloths, everyone thought I had an enormously long table. Extra chairs can be rented to accommodate the guests. When we look for good meal planning ideas for a crowd, we often need to consider the expense. This recipe is very hearty therefore very filling. Many of the ingredients are economical to use for a large crowd recipe. Noodles are not expensive to purchase but I use homemade which I always have in the freezer. For the beans, I cook them from dried beans; very cheap. 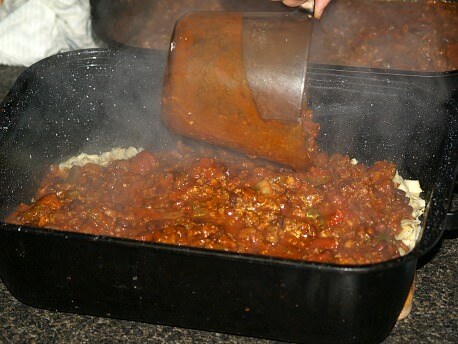 I also use home canned tomatoes and simply season with chili or taco seasoning. 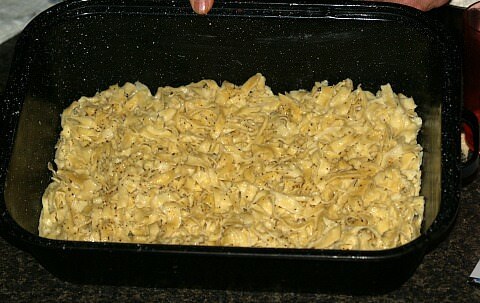 Toss noodles with olive oil and layer in bottom of large pan. (I use roaster which I use for roasting turkey). In a large pan (I also use a roaster) cook over medium heat the meats, onion and bell pepper until meat is done. Add beans, tomatoes, tomato paste, wine or chicken broth, sugar, cilantro, garlic, salt and pepper. Bring mixture to a boil stirring to blend thoroughly; reduce heat to low and keep hot. PREHEAT OVEN TO 400F degrees; mix cornbread topping. 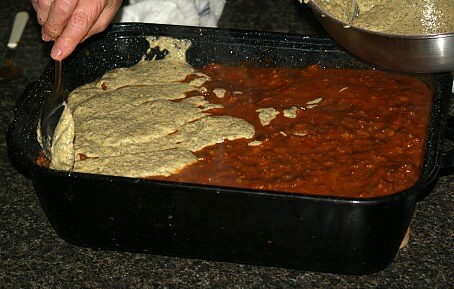 TO MAKE TOPPING combine flour, cornmeal and baking powder; set aside. In a large mixing bowl combine and mix until blended eggs, milk, oil, chives, parsley and garlic salt. Add flour mixture and mix well; stir in grated cheese. TO ASSEMBLE dip all of hot mixture over noodles in pan. Drop batter by large spoonfuls on top of hot mixture. Place in oven and bake for 20 to 30 minutes until top is browned. If your meal planning ideas include doing a sit down dinner, measuring the food accurately is extremely important. It would be terribly embarrassing if you ran short on the food. Always allow for extra to avoid this. Having other people come in to help with the serving of the meal is a good idea, also. If you do all the preparations and the serving, you will have no time to enjoy your company. In a meal such as this, the bean bundles, Marsala sauce, soup, dessert, and garnish can all be prepared a day ahead. If you mash the potatoes and add cream cheese to them, put them in greased baking casserole dishes, they can also be prepared a day ahead. Delicious rolls can be purchased in many local bakeries to save time. This only leaves the tenderloin to be prepared right before serving, which takes only a few minutes. The other dishes can be heated in the oven. Unlike carry-ins or picnics, paper plates are not appropriate at this dinner. - On your “plan “make note of the necessary plates and bowls that will be required. BEEF TENDERLOIN: Buy whole large fillets and slice into individual servings. Sprinkle with a good quality steak seasoning before grilling. Remember when considering your meal planning ideas, your guests will sometimes prefer their meat cooked to different degrees. A favorite part of my meal planning ideas is when I can include a buffet. Buffets can be very beautiful and very accommodating. The guests can fill their plates and find a seat in various places. Usually, they will congregate in smaller groups, which work out fine. A buffet allows the host or hostess to prepare many dishes ahead of time and frees them up for more important tasks, such as visiting with their friends. More foods need to be prepared for refills, but it allows for more economical bowls of food to be available. These could be many salads or pasta dishes which are very appealing to the pallets. With a buffet, there are very informal occasions when paper plates will pass. I, personally, never like to use paper products. They seem to deduct from the quality of your work. On your “plan”, whichever selection you choose, make note of the added bowls, trays and platters you will need. Remember the better your plan is written out, the easier and more successful it will be to produce the final outcome. Cooking for a crowd can be simple with good laid out meal planning ideas. Quite often most of the meal can be baked in a single pan. 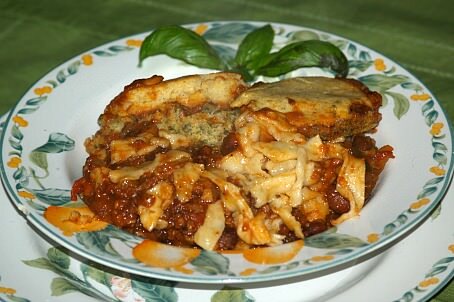 Casserole recipes are most often economical and easy to assemble; they are a meal in one. If you like the addition of a salad and dessert makes a full and complete meal with these recipes. A casserole is a good choice to include in your meal planning ideas. Line pan with tortillas overlapping and running partially up sides. Layer over top of tortillas the chicken, onion, green bell pepper and cheese. Sprinkle top with chili powder and garlic powder. Drop dollops of the condensed cream of chicken soup on top. Combine crushed tomatoes, hot sauce and green chilies and spoon on top of the soup. Bake about 1 hour until bubbly and thoroughly heated. Set for 15 minutes before serving. Brown beef and onions; add all other ingredients except noodles and bread crumbs. 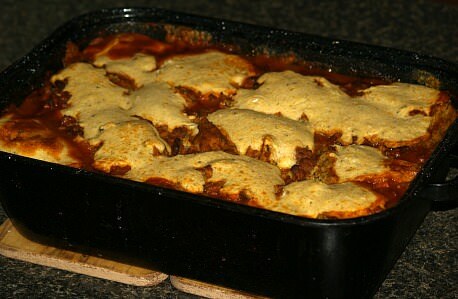 Fold in noodles and mix to blend; spoon into large casserole baking dish or pan. Sprinkle top with dried bread crumbs; bake for 45 to 50 minutes. When brainstorming your meal planning ideas, salads are very easy to add. Make a special homemade dressing like this French dressing. This makes about 3 ½ cups; double recipe for more.